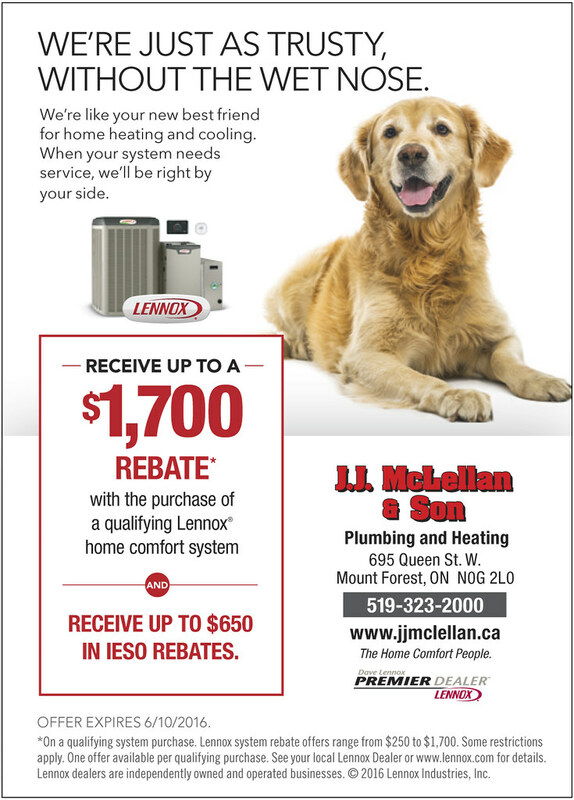 J.J. McLellan & Son | plumbing, heating, ventilation, air conditioning "
With the first official long weekend to truly kick off Spring I know many of us will be doing some spring cleaning of some kind whether its in the house or outside in our yards and garden’s. When it comes to Spring Cleaning its good to remember your Septic System every 3-5 years to ensure your waste water and sewage continues to flow without issues! Do you know the last time your septic system was pumped? Depending on the number of people living in your home, will dictate how often the tank should be pumped. The system is designed to naturally break down solids and then over time will flow out into the weeping bed from the system to properly drain into the ground. If the tank has not been pumped regularly and the solids level becomes too high this can cause issues in the pipe from your home to the tank and also from the tank out into the weeping bed. What happens is the system cannot properly break down the solids when there is more solids than water. If this happens the solids could then begin to flow out to the bed, however as they are solids this will then cause a blockage and could potentially cause a sewage backup in your basement if not rectified properly and in a timely manner. The other thing that could potentially cause issues is if you use too much water and the bed becomes saturated. If you are suddenly using a lot of water, the system will not have time to break down as its designed to and much of the water will just flow out to the bed. If its flowing to the bed, this is good, however ideally the best scenario is for the water to go into the first chamber of the tank with the solids, begin the breakdown process, then flow out into the bed. How do you know if your tank is in need of a cleaning or there is a problem with the weeping bed? If its been over 5 years since the last time you had it pumped. If you are hearing gurgling from your toilets or drains. If you notice wet spots over the weeping bed. If your drains are not draining. Its also important to remember to not plant any trees or bushes around the weeping bed as the roots can grow into the system and cause blockages. Do not pour any oils or grease down the drain as they will harden in the tank and will cause blockages. Do not put any feminine products down the septic system. These will not break down and will pose a potential blockage issues. Wellington County including Wellington North, Mapleton and Minto. Grey County including Southgate and West Grey. 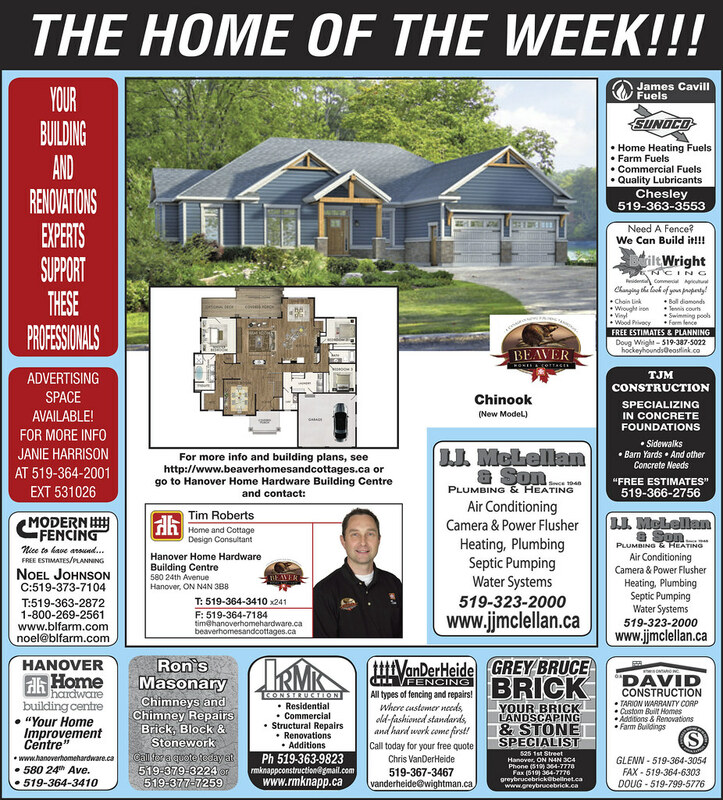 Moorefield, Durham, Ayton, Holstein, Neustadt and all areas in between! Give us a call for your new home build or renovation for a FREE quote! Is it time to update your heating, ventilation and air conditioning system at your home or business? We have the right options for you! We provide sales and service, so if your system has any issues at anytime after we’ve installed it we will be available for you – whether its during the week, in the evening or on the weekend! We service what we sell and more. Is your system simply in need of a cleaning and servicing? We can help with that too! For any systems which are still covered under the manufacturer warranty they recommend having your system serviced yearly to ensure the warranty is still valid. A clean and service can ensure the system is operating as it should, could possibly pick up on a potential wear and tear issue on the appliance and by having it cleaned to ensure its operating efficiently this will also save you on your energy bills! Any questions contact Mike at our office to discuss the various options we have available! Did you know its World Plumbing Day!? Join us in saying a great big THANK YOU to everyone (especially our hard working plumbers and technician’s) who work hard everyday to ensure we have clean, safe water and that our sewage continues to flow! It can be a tough and sometimes very tiring job! As a part of World Plumbing Day and our appreciation for indoor plumbing, clean healthy water and safe sewage systems we must also remember the importance of water conservation in our daily use and taking care of our home and business plumbing systems. A few things to remember to help conserve our water and plumbing systems! Shut the water off when not in use. Upgrade to a low water consumption use toilet. Install a new shower head. 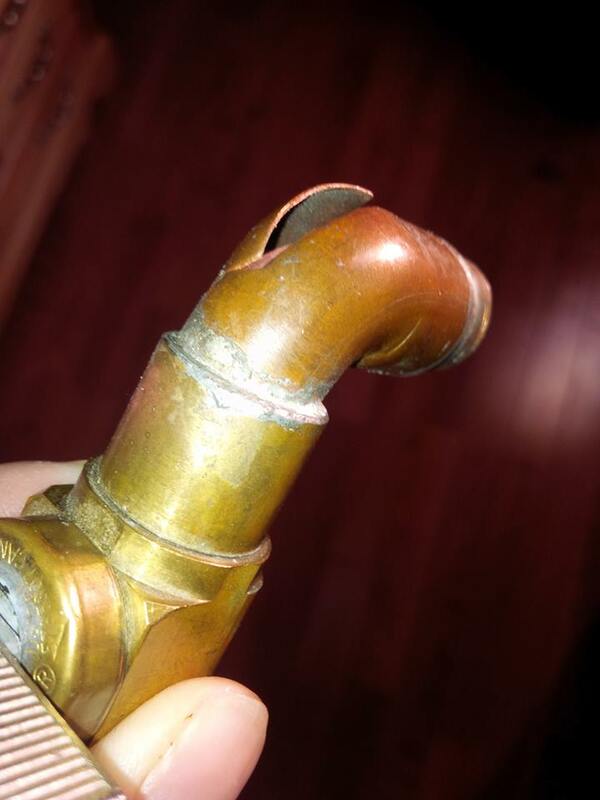 Ensure all plumbing leaks are promptly repaired. Upgrade old water lines to ensure clean, proper and efficient water flow. Only run your dishwasher when it is full. Replace old appliances with new energy star appliances (dishwasher and washing machine). Install a water softener which will clean your clothes better and rinse soap off your body, dishes and clothes easier. If you notice your drains are slow or not draining properly, have this investigated before it causes a back up into your basement. Space out your water usage rather than doing large amounts of laundry in one day (which can flood your septic system) space it out over the evenings of the week and only do a couple loads on the weekends. Use a rain barrel to catch rain water for use in gardens. Ensure you have a proper septic system – septic tank and weeping bed. Know the location of your septic system and weeping bed. When your home was built there would have been a septic plan. Ensure the septic tank lids are always accessible – this is especially important during the winter if you have a back up. There are risers and plastic lids that can be installed which are easier accessible at anytime of the year. Check your septic tank yearly to ensure it is draining properly and pump when the sludge build up is lessening the capacity of your tank. (Approx 3-5 yrs) When in doubt always call a professional. If you have a garborator in your home ensure your septic tank is pumped yearly – or if you are on a septic put your food scraps in a composter. Never put any kind of grease down your drains or into your septic system. If you have a septic system be careful what cleaners you use in the toilet – heavy bleach cleaners can kill micro-organisms important in breaking down and treating waste water. Do not flush paper towels, baby wipes, feminine products, kitty litter, condoms or anything other than toilet paper down the toilet. Even if the product says “flushable” ! We’ve flushed out many blockages due to these “flushable wipes”! 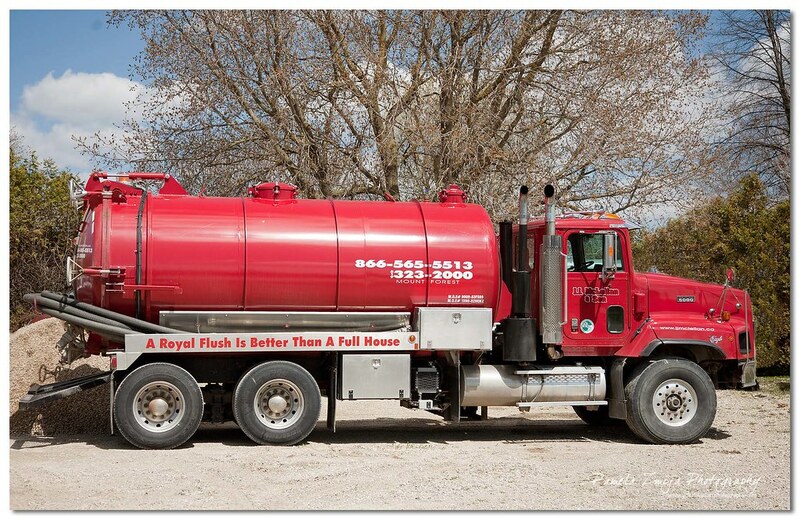 Do not pour any chemicals into the septic tank – the system is designed to work with the natural biological’s which enter the tank to break down. Never drive over, park on or build over top of your weeping bed. In the winter it is important to never plow the snow above your weeping bed, this will help insulate and prevent freezing in colder winters. 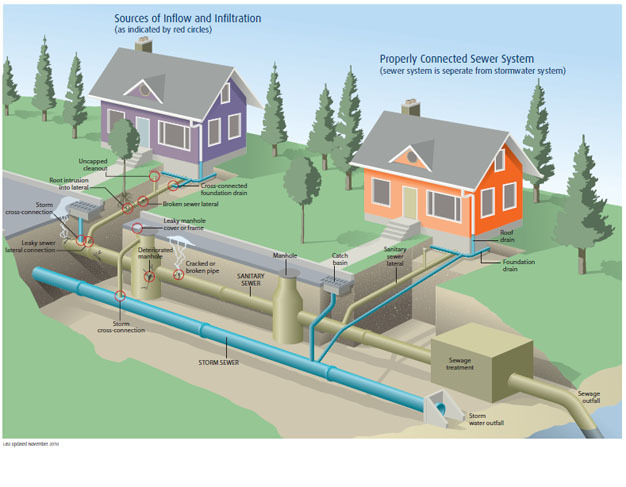 How does your Plumbing System Work??? Here are a few pictures to give you visual of the system! 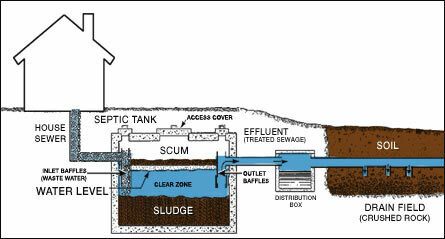 This is a typical home septic system. A colour coded diagram of a home’s basic plumbing system. A home’s plumbing system coming out to the main sewer. We will heat you up and cool you down! 12 Spring Home & HVAC Tips and Hints! Clear any brush or debris away from your vents and air conditioner condenser outside. Remove any debris from your eavestrough and roof. Repair any leaks in the eaves to ensure proper drainage. Examine your roof to determine if any shingles were damaged or fallen off during the winter. Check all exterior taps to ensure once turned on there is no leak inside or out. Walk around your home and check the grading to ensure all landscaping, decking, patio stones or paving is properly slowing away from your home and safe with no cracks or broken deck boards. Check all exterior electrical plugs for proper operation – if there is any damage or a plug is not working be sure to call a qualified and licensed electrician to repair. Pull the lids off your septic tank (if you have one) and check to ensure the tank is properly draining. If you notice your tank has a lot of sludge in it or that your drains are gurgling or slow its time to book a septic tank pumping. Pull out all furniture from walls and thoroughly vacuum and clean behind and under them. Change your furnace filter and vacuum all registers and cold air returns by removing the grates and vacuuming into the duct openings. Check all windows and doors (inside and out) for any cracked caulking or wood damage. Check all indoor plumbing for any leaks and repair or call a professional as required. Ensure if you have a sump pump it is working properly so it is ready for the Spring thaw. Check for dampness in your basement to prevent any mould or mildue growth and ensure your rooms have proper air flow. It’s another extremely cold winter day. 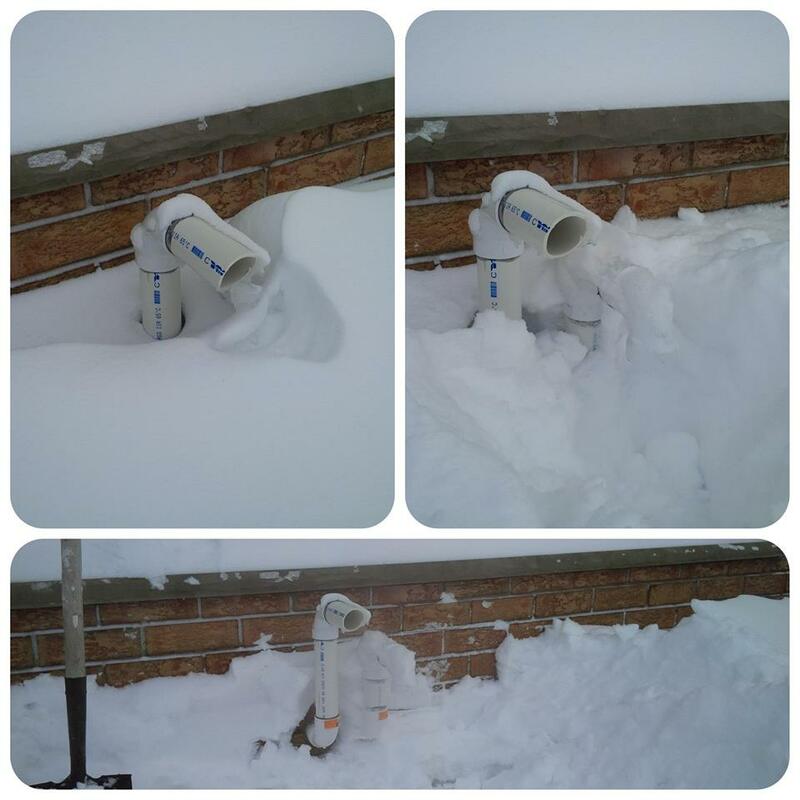 Cold temperatures with blowing snow, it can be a disaster for your home’s Plumbing and Heating! 1. Go out and dig ALL the snow away from all Heating vents – Furnace, Water Heater, Dryer, Fireplace. Blocked vents can cause your system to fail – it needs fresh air to breathe! 2. Some vents have a little screen in them (to stop critters from climbing up in) this can freeze over with the condensate exhausting from the furnace, if it does just pull it out and ensure the vents are completely 100% clear. Remember to replace this in the spring!!! 3. Prevent your water from freezing by running all your taps consistently over the day to keep water running through the pipes or leave a tap running. Especially if you have washrooms you rarely use. 4. If you do not have a heated basement get a heater for the mechanical room – A small room heater that is meant for indoor use will help! Also ensuring the room is well insulated will help too! – Leave the cupboard doors open so heat can get to the pipes. – Insulating your pipes will help as well or putting a piece of hard foam insulation at the back of the cupboards. – Place a small heater close to the pipes – be very careful not to leave it in the cupboard and unattended – do not create a fire risk. If you do not have a small heater, a lamp will help provide extra heat. – Open your taps so that the water has somewhere to expand to, if it does not this is when pipes will burst. – It is essential to have heat in your mechanical room. 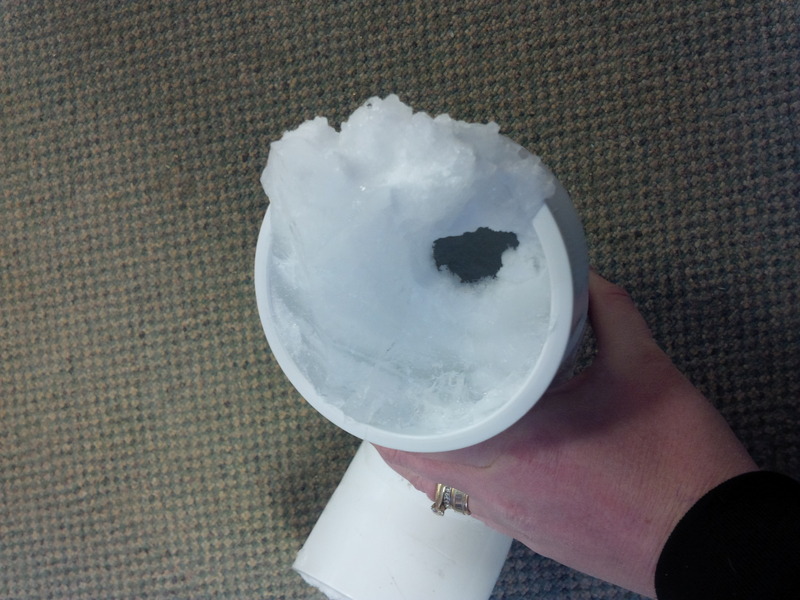 – Wherever your water pipes are outside do not drive over this area as it can push the frost down and cause pipes (and even sewage/septic lines) to freeze! 6. No Heat – no one wants to wake up chilly, especially with temps as low as they are this morning! Do you have back up heat? Its always a good idea to ensure you have a heater or two just in case your heat goes out. A technician will get to you as soon as possible, however in the mean time this will help keep the chill off. Please do NOT use your stove, BBQ or any heater intended for outdoor use in your home – this could be potentially dangerous to you and your family. Start with re-setting your furnace, sometimes it will reset and start up. If this doesn’t work – ensure your vents are entirely clear – this includes down into the pipe where snow and ice can hide causing a blockage. 7. Pets and Children… Please do NOT leave your pets out in these temperatures! It’s way too cold for children to play outside – make it a board game movie day or check out public skating. 8. Vehicles will need to warm up even just for a few minutes before driving. 9. Clear all the snow and ice away from all doors to ensure a proper latch for them to stay properly closed. In temperatures like this it won’t take much to cause problems! 10. It’s Family Day weekend, if you really do not need to go out, Don’t! 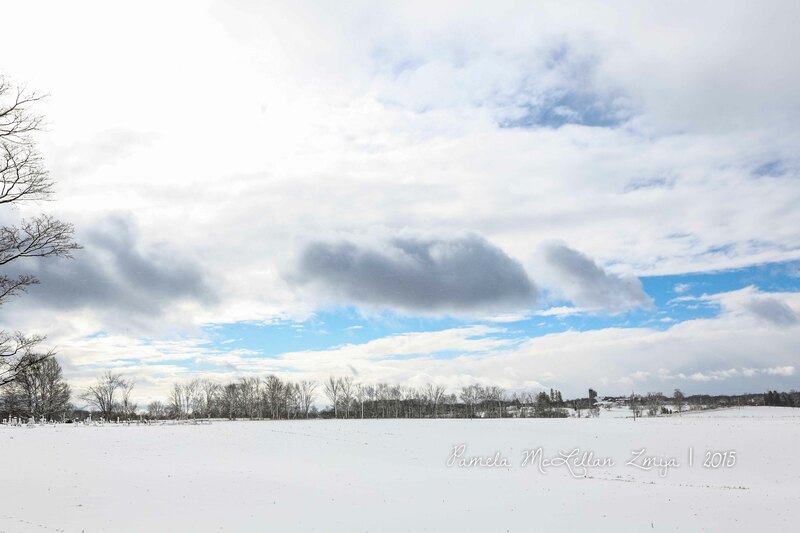 Enjoy the day with your family and stay cozy warm!The sun is shining brightly but its darn cold out there! 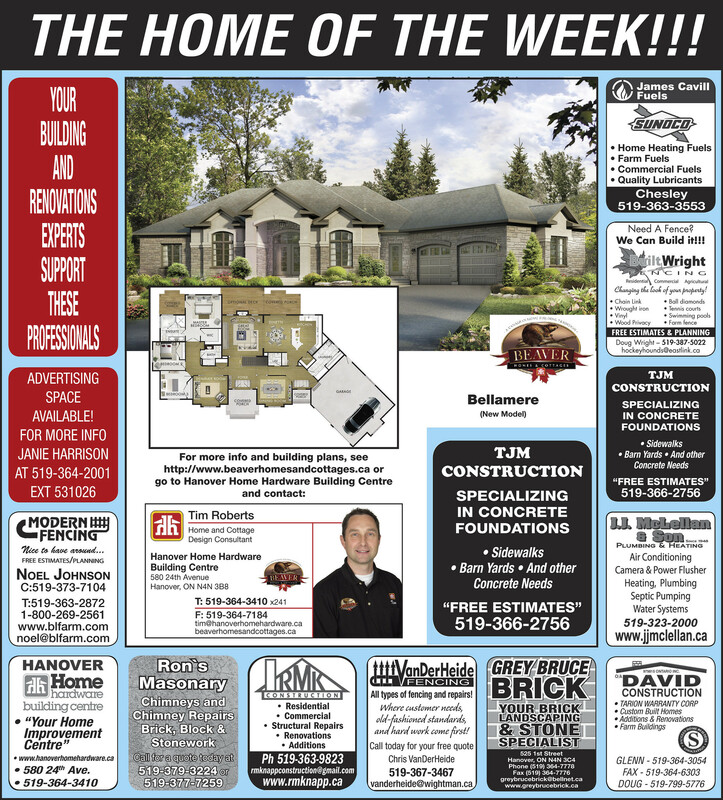 Last week’s home plan has not only an excellent layout but also very spacious rooms! A personal fav of mine is the open kitchen, eating area and great room – but I think the room I love the most is the mud room/laundry room with the two piece just around the corner. What is also great about this plan is it can be modified quite easily to lessen the square footage! 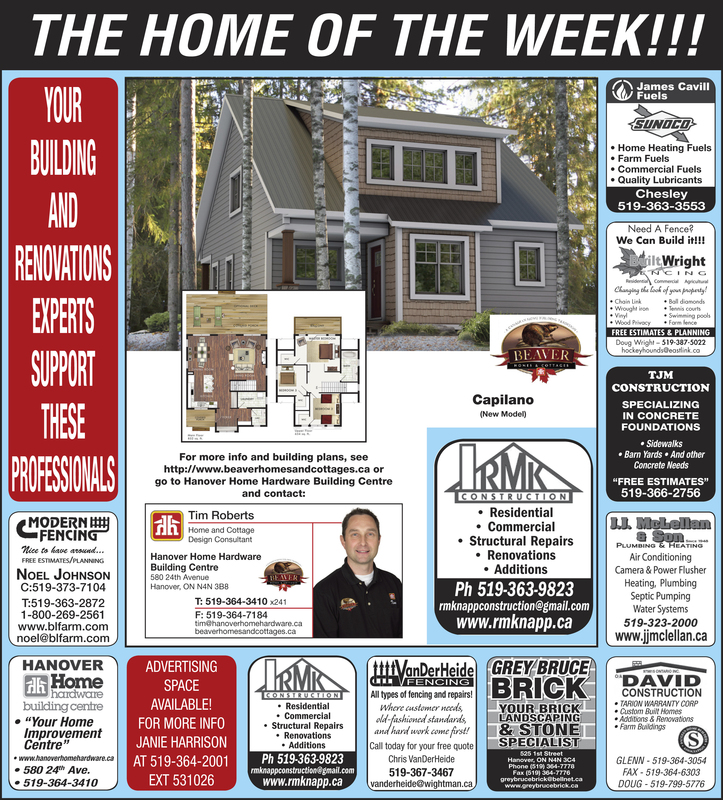 The Home Of The Week published by The Post! If you are in the market for a new home, renovation or simply update your appliances or fixtures give us a call for a free no obligation quote! I don’t know about you but I certainly know our family has enjoyed each and every moment that we could this summer (and still can)! This has meant many days are spent with later breakfasts, snacks vs lunch and late dinners to enjoy the gorgeous weather! Even though my kids have been enjoying daycare camp this summer and have been in that routine, we are all looking forward to truly getting back into the swing of things and our “normal” routine! Get out your cookbooks, tablets or computers and begin collecting all of those recipes that you saw and thought you would like to give a try. Pinterest is awesome for this!!! Then it follows you wherever you go! Ive found when we get the kids to help out in the kitchen or help meal plan they love to try their creations! Have your older kids help with the actual cooking, there is no reason why they cannot be taught the proper use of a stove or cooktop and can assist you this way. We’ve reviewed this with our 9 year old and he is quite proud when I ask him to start the oven to a certain temperature or to start a pot of boiling water or to stir something on the stove. Obviously safety is key and if it involves oil or if we are not in the house this is a big no no! Fire safety with gas is extremely important. Ensure your kids understand the risk and if they are old enough, how to properly turn on the stove. I personally would highly recommend not letting children try to start your BBQ – this is one thing we will not let our 9 year old do even though we now do let him turn on our gas cooktop. Its hard to see the flame and you have to maneuver yourself to light the BBQ, something I even have difficulty with. For the cooktop, if its clicking OR if its turned on and there is no flame – do not even question, turn it off and ask mom or dad to do it! Start slowly with your kids and trust your instincts and them. Its hard to watch them grow and take on more responsibilities but its something that is such a great moral booster for them! Back to School: Tips for Creating a Morning Routine. Its almost that time again… school buses running the roads, kids walking on the sidewalks to and from school! Get your kids started off right with a morning routine custom to their needs and with adequate time for everything to be completed without feeling rushed! Most important – make it fun!! !